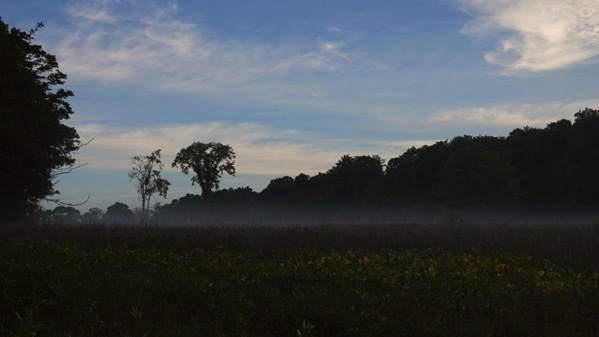 We had a ground-fog morning—still, with heavy dew. So, so pretty. Later, I was out and found this Boletus—breakfast-lunch-and-dinner for a slug. I came by again not five minutes later, and the slug had moved on. Full, I surmised. This place has been called a farm my whole life, but it hasn’t been a farm of any sort in decades. I supposed the last bit of farming that happened on the property was when the field in the first photo wasn’t full of weeds (the yellow bloomers are goldenrod; some of the yellowish leaves are milkweed—neither are cattle food), and was cut for hay. The last time had to have been in the 70s??? 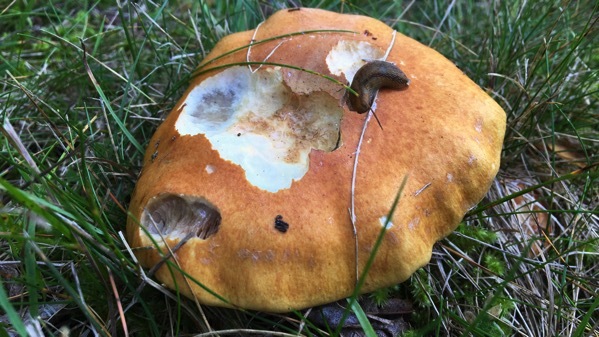 BTW, the most popular Boletus is the edulus species, known as porcini to Italians. Love Boletus—no gills. This entry was posted on Monday, 3 September 2018 at 9:14 pm.